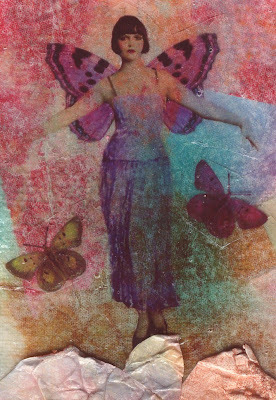 Challenge for THINK MONDAY THINK ATC is mixed media. I randomly applied different papers with pvc glue onto open weave muslin, and then glued some tissue paper over the first layer and then whilst the glue was still wet I applied some inks. The bottom of the ATC is american tyvek postal envelope painted and heated with heat gun. From my point of view this is where I went and ruined the ATC, just seems out of place, they are supposed to be rocks, think I'll go in and change the colours so it ties in with the rest of the ATC. I used transparency images as the background made me think of Scotch mist. This technique is one of BERYL TAYLOR's, you can find the explaination in one of the first issues of cloth paper scissors or in her wonderful book. Bellissima! Grazie delle spiegazioni! secondo me le "rocce" ci stanno benissimo così la figura non è sospesa ma è appoggiata a terra! anch'io penso che le rocce stiano bene, forse le scurirei leggermente..
Grazie della visita! Io continuo a cercare di leggerti, ma Google mi fornisce una traduzione peggiore di quella che posso fare da sola!!!! Rimpiango i tuoi post in italiano. She is so beautiful and the tissue paper technique sounds so interesting! No, not ruined at all! I think it gives it more texture and interest. What a beautiful atc!!! love your background and image and colours! !